If you're a homeowner or business and would like to request more information on the WarmlyYours Radiant suite of products click the link below and fill in the form. 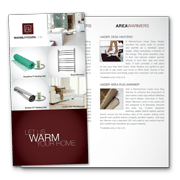 If you're a flooring professional and would like to order WarmlyYours merchandising materials click on the link below. Please note that we are constantly updating and adding new sales and merchandising materials to our list of dealer support aids.